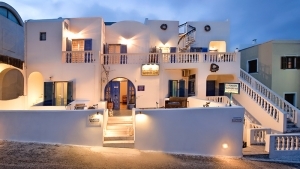 Renovated and refurbished, Athina Luxury Suites, is a 4 star hotel in Fira, built on the cliffs (250 metres above the sea) and overlooking the caldera and the famous sunset of Santorini. 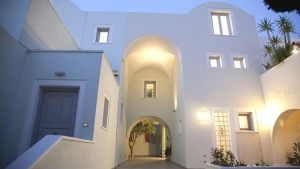 It is at a distance of just 500 metres from the centre of Fira town. The residence features modern comforts blended with traditional local architecture. 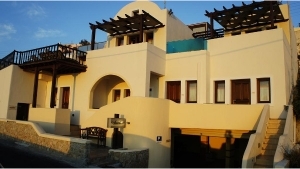 Offers sea-view suites and rooms featuring stone-built beds and sofas, equipped with air condition, sitting area, bathroom, fridge and free internet access. 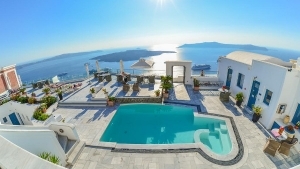 The swimming pool and a sunbathing lounge deck is the favorite spot with views of the caldera and the Aegean sea. The spa facilities include a massage bed and an open-air heated hot tub. Guests are treated with 24 hour reception service. The Luxury Suites can arrange transfers to and from the airport and port upon request. Luggage Luggage Storage, Bar, Air Conditioning, Heating, Non-Smoking Rooms, Express Check-In/Check-Out, Newspapers, Terrace, Sun Terrace. Activities: Fitness Centre, Massage, Outdoor Swimming Pool, Spa & Wellness Centre, Outdoor Swimming Pool (seasonal), Hiking, Cycling, Fishing, Diving, Horse Riding, Windsurfing, Canoeing, Snorkelling. Services: Fax/Photocopying, Car Hire, Room Service, Breakfast in the Room, Dry Cleaning, Laundry, Tour Desk, Ironing Service, Ticket Service, Bridal Suite, Shoe Shine, Concierge Service, Airport Shuttle, Bicycle Rental, Shuttle Service (surcharge), Private Check-in/-out.